A Complete Guide For Diagnosis & Treatment Of Trauma Disorders In Bodybuilders! What is a Cumulative Trauma Disorder? Avoid sports-related injuries such as rotator cuff tears, tendinitis, and more from this comprehensive guide. Details include prevention tips, symptoms, treatment, and more. A Cumulative Trauma Disorder (CTD) describes a mechanism of injury resulting in a variety of musculoskeletal conditions depending on the particular muscles, tendons or ligaments involved. The condition is also referred to as Repetitive Strain Injury (RSI), Repetitive Motion Syndrome (RMS), Occupational Overuse Syndrome (OOS) and. The repetitive movements of muscles and associated support structures cause the tissues to become injured when there is insufficient recovery time. As is similar to static muscle contractions the small blood vessels constrict as the muscles contract thereby preventing a sufficient amount of oxygen from reaching the muscle cells. Metabolic waste products build up in the tissues, because they are unable to be flushed out of the area. The repetitive nature of the activity causes the muscle to become fatigued and the rest cycle is inadequate for the muscle to recover. There may be inflammation involved especially when tendon and ligament structures are affected i.e. tendonitis. The most common sports-related injuries are Cumulative Trauma Disorder (overuse) injuries. As the name implies, an overuse injury results from wear and tear on the body, particularly on joints subjected to repeated activity. The disorder occurs when the body part is called on to work harder, stretch farther, impact more directly or otherwise function at a greater level then it is prepared for. The immediate impact may be minute, but when it occurs repeatedly the constant trauma cause damage and leads to what is commonly referred to as cumulative trauma disorder (CTD) also referred to as overuse syndrome. These conditions are often focused on a joint and affect the muscle and bone. However other areas such as the tendons can be strained. Some common types of overuse injuries are things such as runner's knee, tennis elbow, shin splints, plantar fasciitis, tendonitis, and bursitis. Because the act of bodybuilding requires intense, repetitive training at high intensity (be it through progressively heavier weights, additional sets, additional weight, or less rest between sets) most bodybuilders in the course of their careers will succumb to various injuries caused by overuse. You do not have to be a pro bodybuilder, exercise very intensely or exercise even for a long period of time to develop an overuse injury. Poor body alignment, improper form, high-risk exercises, overtraining, fitness level, and muscle imbalance, can all contribute to these types of injuries. Note: Women can be more vulnerable to these overuse injuries due to fluctuations in hormonal levels. These changes cause fluid retention, which reduces blood flow to muscles. People should pay attention to your technique and form, regardless of the activity; this includes computer work at home. In regards to weightlifting proper form is also extremely important, as is proper posture. Be sure to support your back and don't lock your joints when lifting weights... pay close attention to how your body is aligned throughout the entire exercise. Many exercises in the gym can put the body in precarious situations. For some, even simple exercises can be too demanding for individuals with bone, joint, or muscle problems, or for those who are very overweight. Another common mistake is the "no pain, no gain" mindset by many bodybuilders. This mindset has been around as long as the sport. This can lead to too many sets, too much weight, not enough rest/recovery time; all a recipe for potential problems. While there is some truth to that principle one must remember that exercise is not supposed to hurt. If you feel real discomfort, such as a sharp pain, pain that is deep and are not going away after exercising it's a signal that something is wrong or that you are asking more than your body can tolerate at that point in time. The large muscles involved in shoulder movement are trapezius, deltoid, serratus anterior, pectoralis major and minor, assisted by the smaller muscles teres major, the rhomboids and levator scapulae. These muscles must be in balance to maintain shoulder stability. Normal Shoulder Joint And Muscle & Tendons. Forward head posture can creates tightness to the anterior neck musculature, which can cause abnormal scapula position which may result in shoulder instability. Chronic slumping posture (such as indicated by rounded shoulders and increased thoracic kyphosis) places increased demands on the rotator cuff and can contribute to shoulder impingement, and rotator cuff dysfunction by altering the mechanical function (orientation) of the scapula and humerus. Reference: Greenfield B, Catlin P, Coats P, Green E, McDonald J, North C. Posture in patients with shoulder overuse injuries and healthy individuals. J Orthop Sports Phys Ther. 1995;21:287-295. The cumulative injury cycle can be described in three ways: Acute Injury, Repetitive Injury and constant Pressure or Tension. Left uncorrected, these "events" may lead to inflammation, adhesions/fibrosis, weak and tense tissues and decreased circulation all in a specific progression called the Cumulative Injury Cycle. The end result may result in severe injury, loss of function, need for surgery and possible permanent loss of strength and range of motion. The risk of injury increases when such factors as intensity, frequency and duration of the activity exceed the physical ability of the worker to tolerate the work. The probability of suffering from an overuse injury also increases with age. This probability increases mainly from general wear and tear on the body, particularly on joints subjected to repeated activity, but also from reduced flexibility as we age as well. The probability of suffering from an overuse injury can also increase as a result of other factors that are often not considered. Management of these other factors is one preventative factor for reducing the probability of developing a CTD. Certain job activities may cause or contribute to CTDs. For instance a chef may perform hours of chopping motions putting pressure on the carpal tunnel, contributing to pain felt later when exercising. [ Click To Join The Thread. ] Shoulder Injury. I had some shoulder pain gradually creep up on me last winter, and finally had to stop most upper-body work in early-January. Here's a brief history. Today's technology can also be a culprit. People are spending more and more time online, be it at home, at work, or when furthering their education. Additionally time is spent texting people. The shear amount of time on a computer without care for proper breaks or proper ergonomic posture can contribute to CTD. If you have to spend a majority of your day online, there are things you can do to reduce CTD impact. Ensure that you take frequent breaks and stretch. Ensure that your workstation is properly configured. The keyboard should be positioned so that both arms are bent at 90 degrees at the elbows. Ensure that your hands and wrists are in a straight neutral position. Under no circumstances should the wrists be bent while typing. This causes a tremendous amount of friction and irritation within the carpal tunnel. They rub against the surrounding tissue. The longer this occurs, the more irritation and inflammation develops. Bodybuilding with heavy weights every day to such activities add stress. This extra stress can lead to serious CTD injuries. Understanding the signs is a key to prevention. There are however, ways to minimize the chance and severity of injuries that can occur due to overuse. Of primary importance is knowing the early signs and what to do can help prevent them from becoming nagging problems. Typical signs of CTD include pain, swelling, stiffness, numbness, loss of strength, loss of flexibility/ROM, and many other symptoms that many like to call "getting older". As the symptoms worsen, so does the severity of injury. Failure to recognize the signs may result in permanent injury. The shoulder has the greatest range of motion of any joint in the body. The shoulders allow us to put our hands where they need to be. Not only is this important for weightlifters and those who play sports, but the shoulder plays a vital part in all of our daily activities. With that being said, the shoulder while also having the greatest range of motion of any joint, it can also be the most unstable. Studies over the past decade show the incidence and prevalence of shoulder injuries among elite weight lifters and powerlifters have increased. Reference: The American Journal of Sports Medicine 30:248-256 (2002). Injury Incidence and Prevalence among Elite Weight and Power Lifters. The shoulder joint is surrounded by four muscles and their tendons. These are collectively referred to as the rotator cuff. The rotator cuff is surrounded by an empty sac, or bursa, which helps the tendons slide. As a trade-off for mobility, the shoulder lacks some of the stability found in other joints. The rotator cuff is susceptible to many problems which can cause weakness, tenderness and pain. Tears can occur due to overuse tendinitis, which can be caused by certain activities, which include weightlifting, and overhead sports such as throwing, swimming, or tennis. The rotator cuff tendons are also susceptible to the process of aging. As we get older, the rotator cuff tendons degenerate and weaken. A rotator cuff tear can occur due to this degeneration alone, but the risk dramatically increases due to overuse. Rotator cuff tears can also occur if the tendons are overloaded in weight lifting or football. Diagnosis of a rotator cuff tear is based on the symptoms and physical examination, as well as using imaging studies, such as MRI (magnetic resonance imaging) which can visualize soft tissue structures such as the rotator cuff tendon, whereby x-rays can not. Examine the shoulder to see whether it is tender in any area or whether there is a deformity. Measure the range of motion of the shoulder in several different directions. Test the strength of the arm. Check for instability or other problems with the shoulder joint. Anti-inflammatory medicines are medications prescribed to reduce inflammation (a protective action of the body as a response to trauma, injury). There are two types of anti-inflammatory medications. They are steroidal or non-steroidal drugs. Nonsteroidal anti-inflammatory medications such as aspirin, naproxen (Aleve) or ibuprofen (Motrin, Nuprin), coupled with the use of ice to reduce inflammation and rest is the most common treatment plan for this condition. NSAIDs are particularly useful not only because they help decrease pain, but they also help control swelling and inflammation. Non-steroidal anti-inflammatory drugs are drugs with analgesic, antipyretic and anti-inflammatory effects - they reduce pain, fever and inflammation. The term "non-steroidal" is used to distinguish these drugs from steroids, which (among a broad range of other effects) have a similar eicosanoid-depressing, anti-inflammatory action. NSAIDs are available both over-the-counter and as a prescription. This treatment plan typically takes 6 to 10 weeks to be effective. Why? Because anti-inflammatory medications must be taken for a significant period of time (with rest to the muscles) to address the underlying problem, otherwise the symptoms (including the pain) will in most probability reappear. The length of treatment, the choice of anti-inflammatory and the success of the treatment will vary from person to person. There are several new NSAIDS (the so-called COX-2 inhibitors) on the market. There has been no study showing that newer NSAIDs treat pain or swelling any better than more traditional NSAID medications such as aspirin and ibuprofen. All medications have side effects, and the most common side effect from NSAIDS is stomach or gastrointestinal upset. Therefore, NSAIDS should be taken with food, and discontinued if abdominal pain persists. Other common side effects may include nausea, vomiting, diarrhea, constipation, decreased appetite, dizziness, rashes, headache, and drowsiness. Another side effect of NSAIDS is interfering in the normal blood clotting mechanism. NSAIDs can cause ulcers in the stomach and promote bleeding. Patients on chronic NSAID use may notice easy bruisability, bleeding gums, or other signs of "thinned blood". NSAID's may also cause fluid retention, leading to edema. The most serious side effects are kidney failure, and liver failure. One of the best reasons to consider some of the newer medications, however such as Celebrex, is that these may be taken as once-a-day doses rather than three or four times daily, and the COX-2 inhibitors are thought to have fewer side-effects on the stomach. [ Click To Join The Thread. ] NSAIDs. Many of you may have heard about how NSAIDs can reduce inflammation from training, and thus inhibit protein sythesis. Additionally COX-2 inhibitors may be the medicine of choice if there is a need to take medication for several months or longer. Reference: Berger, RG "Nonsteroidal Anti-inflammatory Drugs: Making the Right Choices" J. Am. Acad. Ortho. Surg., Oct 1994; 2: 255 - 260. When taking NSAIDs, it is important to realize that people may respond differently to medication. It is difficult to predict which medications will most benefit a given individual. Therefore the best way to determine which NSAID is best for you is to try different options. If adequate relief of symptoms is not obtained within several weeks of treatment, your surgeon should prescribe a different NSAID. If you have persistent symptoms, despite the use of oral anti-inflammatory medications, your doctor may consider a anti-inflammatory injection such as cortisone. Injectable cortisone is synthetically produced and has many different trade names (e.g. Celestone, Kenalog, etc. ), but is a close derivative of your body's own product. The difference being synthetic cortisone is a potent anti-inflammatory medication. Cortisone injections usually work within a few days, and the effects can last up to several weeks. The most common side-effect is a "cortisone flare," a condition where the injected cortisone crystallizes and can cause a brief period of extreme pain that usually lasts a day or two and is best treated by icing the injected area. Nonsurgical treatment typically involves activity modification (avoidance of activities that cause symptoms). Statistics show that nonsurgical management of a rotator cuff tear can provide relief in approximately 50% of patients. Reference: American Academy of Orthopedic Surgeons, webpage. Accessed November 2, 2007. Surgeons may recommend non-surgical treatment for patients who are most bothered by pain, rather than weakness, because strength does not tend to improve without surgery. There are several studies that show that approximately 50% of patients have decreased pain and improved motion and are satisfied with the outcome of non-surgical treatment. If the options fail to provide relief after several months of treatment, then surgery may be considered. The decision to have surgery often will depend on the current level of pain, and expectations of use. Smaller tears can be monitored to see if non-surgical treatments may help alleviate symptoms. If symptoms do not interfere with usual activities, then surgery may not be required. On the other hand, athletic patients, such as competitive bodybuilders, who injure their shoulder may need surgery to return to the sport. It is important to pay attention to larger tears because larger tears can retract (leading to a permanently shortened tendon), and the muscle may irreversibly weaken, and complicate the repair as well. Therefore, earlier surgery may help increase the likelihood of successful recovery and an ability to return to normal activities, even those of a competitive nature. When conservative treatments have failed. The type of repair and recovery depends on the size, shape and location of the tear. A partial tear may require only a trimming or smoothing procedure called a "debridement," or it may require removing thickened bursal tissues (bursitis) or calcium deposits and/or bone spurs impinging on the tendon. During surgery the cuff is cleared of scar tissue and debris, an anchor is introduced and placed in the bone, the suture is passed through the tendon and tied in place. Pending the size of the tear, repeating these steps multiple times completes the repair. The open repair was the traditional repair method before the use of better technology and smaller tools. In this method an incision, usually about 6-10 centimeters in length was made over the outside of the shoulder. The muscle beneath the skin was separated to expose the rotator cuff, and the rotator cuff was then inspected and repaired. This technique is no longer favorable for many reasons, such as the scar, the increased pain, and potential delay in recovery. 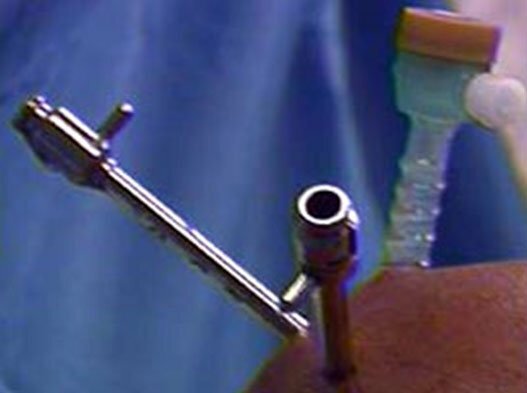 In the "mini-open" technique, an arthroscopy is performed on the shoulder. This involves looking at the joint and the rotator cuff with a small camera inserted into the joint, and visualizing this on a television monitor. Much of the work is done with the arthroscope (camera) and small instruments, and the actual repair is done through a small incision, usually about 3-4 centimeters. Most surgeries today are done using arthroscopic instruments. Instead of making a larger incision and looking directly at the rotator cuff, the surgeon makes several small incisions (about 1 centimeter each) and works with small instruments while looking at the rotator cuff on a television monitor. This approach results in less scarring, less pain and quicker recovery. Quality of tissue and integrity of repair. Degree of shoulder instability/laxity prior to surgery. Age of injured person (50 years old typically have stronger tissue). Acute vs. chronic tear (repairs before 4 months typically respond better, while chronic tears typically more difficult to achieve range of motion. Chronic and/or large tears will also require more caution with active range of motion and resistive exercises. First vs. revision surgery (revisions are more prone to fibrosis and pain). Control pain, inflammation, and effusion. Regain full motion within 3 months after surgery. A physical therapist will assist in the early stages with gradual recovery of motion. Regain normal upper extremity strength and endurance. Achieve the level of function based on the orthopedic and patient goals. The average recovery for a medium tear will include wearing a sling for the first 2 weeks (except for passive range of motion (PROM) exercises). Once initial healing is achieved, a progressive stretching and strengthening program should begin. Physical therapy is carefully controlled in the first 12 weeks while the tendons heal back to the bone. Ice should continue to be applied for the first few days as much as possible to control pain and swelling. Physical therapy will typically begin within a week following surgery. The early focus will be on achieving range of motion before emphasizing rotator cuff resistance exercises. Early passive range of motion of the glenohumeral joint is essential to prevent capsular adhesions and fibrosis. Early passive range of motion is also highly beneficial to enhance circulation within the joint to promote healing. After two weeks the recovery typically includes decrease use of sling during the day. The sling is still typically used in uncontrolled situations and at night to protect the shoulder during sleep. PROM exercises within limits and pain tolerance are continued, with manual resistance for scapula motions. Resting pain should be used to gauge progression. Overall, pain should decrease over time. Typically a physical therapist will be employed and provide gentle soft tissue mobilization and joint mobilization. Modalities as indicated for pain or inflammation are still used. The supervised rehabilitation program is supplemented by a home fitness program where the patient performs the given exercises for the given time period (like PROM during the first six weeks) at home or at a gym facility. Its been giving me problems off and on but today it hurt more than it ever did before, only the left side, what do you recommend I do to get rid of the pain? Assisted range of motion (AROM) in all ranges, including the use of physical therapy wands (such as a Bodyblade) in all planes, therapy bands cables and pulleys. The Bodyblade is a reactive, oscillating device that utilizes inertia to generate up to 270 muscle contractions per minute. The laws of inertia state that an object set in motion remains in motion until another force acts upon it to stop or change its direction. You push and pull on the apparatus, which accelerates the blade and creates a force due to the flex or amplitude of the blade. The greater the flex, the greater the resistance that is needed by the body to counteract the destabilizing forces delivered into the body. The blade's movement therefore requires the user to contract his or her muscles in order to neutralize these forces. Therefore wands such as the Bodyblade can be used at the users own pace to assist in post operative recovery and muscle stabilization. TheraBands is a brand of resistive bands that can be used to improve post operative muscular endurance and strength, range of motion (ROM) and flexibility. They come in color-coded resistance levels that can be used to customize the rehabilitative program. Joint mobilization for glenohumeral and scapula mobility. If range of motion is still limited, then emphasis should remain on achieving full range. Strengthening exercises (using higher rep, low weight) for scapula stabilizers and rotator cuff such as submaximal isometrics, scapular stabilizer strengthening-active assisted shrugs, Bicep/Tricep work, TheraBands, proprioceptive neuromuscular facilitation (PNF), and upper body ergometer (UBE). At approximately 12 weeks - 16 weeks motion in most planes should be nearly full and progressive resistive exercises (such as military press, bench press, flyes, lat pulldowns) can be initiated (with surgeon approval/clinical evaluation) as tolerated. Resting pain should be used to gauge progression. Emphasis should be made on strengthening and stability exercises. Caution should be employed to avoid exercises that stress repair. At approximately 24 weeks aggressive stretching and strenuous resistive exercises can typically be performed (with surgeon evaluation/approval). Full recovery can take more than 6 months. Some patients may require more time to regain muscle strength and complete the healing process. To avoid complications, postoperative follow up appointments with your physician should be scheduled to monitor recovery progress. The labrum is one of two types of cartilage found in the shoulder joint (the other being the white cartilage on the ends of the bones called articular cartilage which allows the bones to glide and move on each other). Labrum cartilage is found only around the socket where it is attached. When articular cartilage starts to wear out the joint becomes painful and stiff. This process is called arthritis. The shoulder joint is a ball and socket joint, similar to the hip. The socket of the shoulder joint is extremely shallow, and inherently unstable. To compensate for the shallow socket, the shoulder joint has a cuff of cartilage called a labrum that forms a cup for the end of the arm bone (humerus) to move within and hold the joint in place while allowing a very wide range of movements (more than any other joint in the body). A second function of the labrum is as an attachment of other structures or tissues around the joint such as the ligaments that help hold the joint together. Another structure that attaches to the labrum is the tendon of the biceps muscle. The tendon is about the size of a pencil attaches inside the shoulder joint at one end and to a larger tendon which attaches beyond the elbow in the forearm. The portion which attaches in the shoulder goes through a small hole in the rotator cuff tendons and once inside the joint the tendon attached in part to the bone near the socket and in part to the labrum at the top of the joint. The labrum is made of a thick tissue. The ligaments of the shoulder are attached to the socket at the labrum. When a patient sustains a shoulder injury, it is possible that the patient has a labral tear. The labrum also becomes more brittle with age, and can fray and tear as part of the aging process, and also because of shoulder instability. Superior Labrum Anterior and Posterior (SLAP) Tear, a type of labral tear that occurs the top of the shoulder socket where the biceps tendon attaches to the shoulder. Common mechanisms of a SLAP tear include falling onto an outstretched hand, repetitive overhead actions (throwing), and lifting a heavy object. The area of the labrum where the SLAP tear occurs is susceptible to injury because it is an area of relatively poor vascularity. Other areas of the labrum often heal more easily because the blood supply delivers a healing capacity to the area of the tear. In the area of SLAP tears this is not the case, and chronic shoulder pain can result. Typical symptoms of a SLAP tear include a catching sensation and pain with overhead movement, most typically overhead activities such as throwing. Patients usually complain of pain deep within the shoulder or in the back of the shoulder joint. It is often hard to pinpoint symptoms, unless the biceps tendon is also involved. Posterior Labral Tear - Seen in athletes in a condition called internal impingement (when the rotator cuff and labrum are pinched together in the back of the shoulder). Bankart Lesion - A labral tear that occurs when a shoulder dislocates. It is important to understand that labrum tears often occur in conjunction with other shoulder problems such as rotator cuff tears, and even shoulder arthritis. [ Click To Join The Thread. ] Anyone With A Labrum Tear? Is there anyone out there that has (or has had) a labrum tear? If so, I would love to hear about your experience. Because the labrum is located deep in the shoulder, it is very difficult to make the diagnosis of a torn labrum upon physical examination. The relationship between labrum tears and symptoms has not been totally figured out, so it is not clearly known which ones should be repaired and which ones can be left alone. There are several tests that the surgeon can perform which may indicate a torn labrum, but these tests are not always accurate, especially since labrum tears take different forms as described above. Certain tests may detect one kind of tear but not another. The best tests available to make the diagnosis of a labral tear are magnetic resonance imaging (MRI) or a test called a CT-arthrogram (a CAT scan preceded by an arthrogram where a contrast dye called gadolinium is injected into the shoulder to highlight tears of normal structures, including labrum tears. Both of these tests are relatively good at defining a labrum tear due to a subluxation or dislocation, but they are only around 80-85% accurate. Neither test is currently very good at making the diagnosis of a SLAP lesion because it is difficult to reliably get good pictures of this area with MRI. Magnetic resonance imaging is primarily used in medical imaging to visualize the structure and function of the body. It provides detailed images of the body in any plane. MR has much greater soft tissue contrast than computed tomography (CT) making it especially useful in neurological, musculoskeletal, cardiovascular, and oncological imaging. The best way to make the diagnosis of labrum tearing is with arthroscopy of the shoulder. Arthroscopic surgery involves the use of a special camera attached to a long, narrow surgical telescope to visualize the inside of a joint. The camera transmits the signal to a video monitor for improved visualization, as well as allowing photographic and videographic documentation of the surgical findings and the procedure performed. Working through small incisions about the size of dime Small (5mm) in the back, side, and front of the shoulder the surgeon can use specially created instruments to repair damaged tendon, cartilage, capsule, and other tissues. The three incisions are made so that the arthroscope and instruments may be switched between each of these positions as necessary. Unfortunately this is an operative procedure and requires some form of anesthesia. Making the diagnosis also takes some experience on the part of the surgeon, since the anatomy of the inside of the shoulder can be quite complex. Most labral tears do not require surgery; however, in patients who have persistent symptoms despite more conservative treatments, arthroscopic surgery of the shoulder may be necessary. Today, thanks to increased surgeons' skills and advances in instrumentation, it is possible to fix not only small tears using arthroscopic techniques to insert anchors, pass sutures, and tie knots, but also repair even large rotator cuff tears using arthroscopic techniques. There are several specific surgical procedures that may be performed, depending on the type and extent of the tear. The surgeon will complete diagnostic arthroscopy and bursoscopy (inspection of bursa) with the specialized camera attached to a long, narrow surgical telescope to inspect the biceps tendon within the shoulder, the fibrous ring or "labrum" which surrounds the glenoid, the capsule and ligaments, the cartilage surfaces of the head and glenoid, and the rotator cuff tendons to determine the treatment approach. Debridement. When a tear is debrided, the torn portion of the labrum is shaved away to leave a smooth edge. This option is only suitable for minor tears that do not involve the biceps tendon. Repair. A labrum repair is an arthroscopic procedure that uses sutures with anchors attached to resecure the torn labrum down to the shoulder socket. It is typically performed when the attachment of the labrum (the so-called biceps anchor) is unstable and when debridement would not be adequate to alleviate the symptoms of the SLAP tear. Biceps Tenodesis. A biceps tenodesis is a procedure that cuts the biceps tendon from where it attaches to the labrum, and reinserts it in another area to decrease forces that pull on the labrum. It can either be performed arthroscopically, or through a small incision over the top of the shoulder. Determining how to best perform a biceps tenodesis depends primarily on other conditions being treated within the shoulder joint. Because the arthroscope magnifies the structures seen, irregularities in the surface of less than 1 mm may be seen and removed, such as spurs. If required the under-surface of the acromion may also be smoothed to provide more room for the repair and to relieve pressure from the healing tendon. After the completion of the procedure, the shoulder is typically injected with a long acting local anesthetic to assist with postoperative pain management, the incisions are closed with a single nylon stitch and covered with steri-strip tapes, followed by a dry sterile dressing. Ice (or a Cryocuff) shoulder pad is applied to provide postoperative cold therapy to assist in post operative pain and swelling management. In my case a Don Joy Ultrasling II was applied to immobilize and protect the procedure performed and remove stress and tension on the sutured tendon. Recovery depends upon many factors, such as where the tear was located, how severe the tear was, whether the ligaments were reconstructed (bankart repair, anterior capsular shift), and how good the surgical repair was. It typically takes at least four to six weeks for the labrum to re-attach itself to the rim of the bone, and probably another four to six weeks to get strong. Once the labrum has healed to the rim of the bone, caution should be taken regarding stressing the labrum (which includes stressing the bicep tendon) so that it can heal. If the ligaments are reconstructed (as in a bankart repair, or a anterior capsular shift) the recovery will tends to be longer. Regarding returning to work most people will need a week off from work (for most sedentary jobs). When you return to work your arm will be in a sling but you should be able to manage as long as you do no lifting, pushing, pulling or carrying. Most patients can start light duty work involving no lifting, pushing, pulling or carrying more than one to two pounds, 6 weeks after surgery. Work at waist level and 5-10 pounds of lifting is started 3 months after surgery. You will generally need 3-6 months of recovery before beginning occasional work at the shoulder level, but a return to heavy lifting or overhead use may require 6-12 months. Hand Squeezes or Grip Strengthening. This is typically done using a small soft rubber ball or soft sponge. 3-5 sets of 10-20 repetitions each day is typically what is prescribed. Wrist Range of Motion: Roll your wrist in circles for 30 seconds after each round of grip exercises. Elbow Range of Motion Exercise: Turning your palm inward, towards your stomach, flex and extend the elbow as comfort allows. This will decrease pain and prevent elbow stiffness. [ Click To Join The Thread. ] Torn Labrum Recovery? I am experiencing some soreness and pains that I am not sure if they are normal during recovery from the SLAP surgery. Pendulum Exercise: Holding the side of a table with your good arm, bend over at the waist, and let the affected arm hang down. Swing the arm back and forth like a pendulum. Then swing in small circles and slowly make them larger. Do this for a minute or two at a time, rest, then repeat for a total of 5 minutes, 3 times per day. Wall Walking Exercise: This is done by facing a blank wall with your feet approximately 12 inches away. "Walk" the fingers of the effected hand up the wall as high as comfort allows. Do at least 10 repetitions, 3 times per day. The goal is to slowly "walk" the hand higher to increase range of motion. When more comfortable and stronger (not before three weeks) your surgeon may allow you to do this exercise sideways, with the effected side facing the wall. Walk your finders down the wall as well as up. Important: Do not let the hand drop down from the wall - this will be painful and strain the repair. If you will have weakness on the way down, use the other arm to help. Biceps Curls: Curl the arm up and down 12 times; rest for one minute and repeat for a total of 3 sets of 12. This exercise should not be painful. If painful decrease or eliminate the weight. How much motion and strengthening of the arm is allowed after surgery also depends upon many factors, and it is up to the surgeon to let you know your limitations and how fast to progress. Because of the variability in the injury and the type of repair done, it is difficult to predict how soon someone can to return to activities and to sports such as bodybuilding after the repair. However, a majority of patients have full function of the shoulder after labrum repair. Typically your surgeon will allow walking, and stationary bicycle riding within one to two weeks after surgery. Returning to weight lifting is unpredictable. You may need one full year before performing activities such as the bench press and you may never recover enough to lift heavy weights. Biceps tendonitis, more properly termed tendinosis, refers to the inflammation, pain, or tenderness in the region of the biceps tendon in the front part of the shoulder or upper arm. Years of shoulder wear and tear can cause the biceps tendon to become inflamed. Examination of the tissues in these cases commonly shows signs of degeneration. Degeneration in a tendon causes a loss of the normal arrangement of the collagen fibers that join together to form the tendon. When this occurs individual strands of the tendon become frayed, some break, causing the tendon loses strength; which could also cause the tendon to eventually rupture. Because the bicep tendon attaches inside the shoulder through a small hole in the rotator cuff bicep tendinitis is usually associated with rotator cuff pathology. You feel pain when you touch the front of your shoulder or during certain activities, such as throwing. You feel pain when you move your arm and shoulder, especially when you move your arm forward over shoulder height. Rotator cuff/bicep tendinosis is diagnosed by eliciting pain or weakness with stress testing of the rotator cuff muscles. There are two common tests used for diagnosis of impingement: The Neer's Test and the Hawkins' Test. The Neer's test elicits pain with passive abduction of the shoulder to 180 degrees. The Hawkins' test elicits pain with the shoulder passively flexed to 90 degrees and internally rotated. Most people, if they pay attention to the signs and symptoms of tendinitis and address the problem early will respond to non surgical therapy. Surgery may be recommended if the problem doesn't go away after such treatments, chronic conditions or when there are other shoulder problems present. The most common surgery for bicipital tendinitis is acromioplasty, especially when the underlying problem is shoulder impingement (see discussion above). Acromioplasty involves removing the front portion of the acromion, the bony ledge formed where the scapula meets the top of the shoulder joint. The purpose behind removing a small portion of the acromion, is to create more space between the acromion and the humeral head so that there is less pressure on the soft tissues and the bicep tendon located in between the acromion and humeral head. Excision of the anterior hook of the acromion for the relief of pressure on the rotator cuff produced during movement of the joint between the glenoid cavity and the humerus. Acromioplasty is a relatively simple procedure for a skilled orthopedic surgeon. It is usually done using an arthroscope. The surgeon will make a small incision in the skin over the shoulder joint, use the arthroscope to locate the deltoid muscle on the outer part of the shoulder. The surgeon will then split the front section of the deltoid so that the acromion is visible. Depending upon condition and style of the surgeon, the surgeon may also detach the deltoid muscle where it connects on the front of the acromion. The surgeon then will remove the bursa sac that lies just under the acromion. Following the removal of the bursa sac the surgeon will use a surgical tool is used to cut a small portion off the front of the acromion to create the required space between the acromion and the humeral head (note the ligament arcing from the acromion to the coracoid process, called the coracoacromial ligament may also be removed). The surgeon will then use a surgical file to shave the undersurface of the acromion to remove any bone spurs. Then a series of small holes are drilled into the remaining acromion so that the surgeon can reattach the deltoid muscle to the acromion. At this stage the surgeon will also inspect the rotator cuff muscle to see if any tears are present, since a large number of these injuries tend to go hand in hand. If there are no rotator cuff tears the surgeon will attach the free end of the deltoid muscle to the ridge of the acromion using the drill holes made earlier. If upon inspection the biceps tendon is severely degenerated, as was in my case, the surgeon may perform biceps tenodesis. Biceps tenodesis is a method of reattaching the top end of the biceps tendon to a new location when the biceps tendon is severely degenerated or when shoulder reconstruction for other problems is needed. The most common method of bicep tenodesis used today is called the keyhole technique. It is called this because a small hole, the size of a keyhole is made by the surgeon using a burr in the humerus which the surgeon used to slide the end the tendon into. The tendon is then pulled down to anchor it in place. [ Click To Join The Thread. ] Bicep Tendinitis? I went to the doctor about my shoulder hurting so much from doing chest exercises. It wasn't a huge issue but I knew it was a warning sign. Before performing the reattachment, the tendon is prepared by cutting away frayed and degenerated tissue. Once prepared the surgeon rolls the top end of the bicep tendon into a ball, uses sutures to ensure that the ball shape stays that way and after bending the elbow to remove tension from the tendon, pushes the tendon ball into the top part of the keyhole. The surgeon gradually straightens the elbow, and as this is done the tendon ball is pulled into the narrow slot in the lower end of the keyhole, and is set in place. The surgeon completes the procedure by closing the incision with sutures. Everyone recovers from an injury at a different rate. Like other overuse injuries the length of recovery depends on many factors such as your age, health, severity of the injury, and if you have had a previous injury. Recovery typically involves controlling pain and inflammation with Ice, rest and anti-inflammatory medicines. Some surgeons prefer to have their patients start a gentle range-of-motion program soon after surgery; others prefer to start a few days after surgery. Once cleared by the surgeon they should be done every day for the first week post-op, to maintain blood flow and help prevent blood clots. Note: rehabilitation protocol and restrictions may vary based on extent of repair, and other factors, therefore rehabilitation protocol should be discussed with your surgeon. Physical therapy will typically begin 3-4 days after surgery under the direction of the surgeon. It is very important for you to start therapy when recommended and follow the recommended rehabilitative protocols in order to maximize recovery. Graduated physical therapy is vital to proper recovery and to increase muscle strength and range of motion during the recovery process. Physical therapy combined with assigned home exercising/strengthening may be required for approximately six to eight weeks. The first few therapy sessions may involve nothing more than passive range of motion exercises followed by ice and electrical stimulation treatments to help control pain and swelling from the surgery. If you are experiencing muscle spasm and significant pain your therapist may also use massage and other types of hands-on treatments to ease these symptoms. Passive ROM for elbow flexion and supination (with elbow at 90 degrees). Assisted ROM for elbow extension and pronation (with elbow at 90 degrees). Shoulder ROM as needed based on evaluation, avoiding excessive extension. Sub-maximal pain-free isometrics for triceps and shoulder musculature. Sub-maximal pain-free biceps isometrics with forearm in neutral. Gradual active strengthening exercises to strengthen and stabilize the muscles and joints of the elbow and shoulder. Single plane active ROM elbow flexion, extension, supination, and pronation. Progressive resisted exercise program is initiated for elbow flexion, extension, supination, and pronation. Return to normal activities will be determined by how soon your tendon recovers, not by how many days or weeks it has been since the injury has occurred. You need to stop doing the activities that cause pain until the tendon has healed. If you continue doing activities that cause the tendon pain, your symptoms will return and it will take longer to recover. Persistent pain and weakness may be a sign of a serious strain of the biceps that may also involve tearing of the attachment of the tendon inside the shoulder joint. Such serious injury may require surgery. If persistent pain and weakness is experienced the injury should be re-evaluated by a surgeon. Many patients seek medical attention for shoulder pain, and a common diagnosis given is "shoulder bursitis," or "shoulder tendinitis." Shoulder bursitis and rotator cuff tendinitis are all ways of saying there is inflammation of a particular area within the shoulder joint that is causing a common set of symptoms. The best terminology for these symptoms is "Impingement Syndrome." Impingement syndrome occurs when there is inflammation of the rotator cuff tendons and the bursa that surrounds these tendons. Impingement Syndrome is a common condition affecting the shoulder. It is most commonly seen in aging adults. Impingement syndrome refers to impingement of the rotator cuff tendons, especially the supraspinatus tendon, under the subacromial arch. The biceps tendon or the subacromial bursa may also be impinged under the subacromial arch. Bursitis is the inflammation of one or more bursae, or small sacs of synovial fluid. Bursae rest at the points where internal functionaries, like muscles and tendons, slide across bone. Healthy bursae create a smooth and almost frictionless gliding surface. Impingement Syndrome is closely related to shoulder bursitis and rotator cuff tendinitis. It is not uncommon for these conditions to occur in combination. It is not clear whether rotator cuff muscle/ tendon overload precedes impingement or is caused by it. (References: Souza TA, ed. Sports Injuries of the Shoulder. New York, NY:Churchill Livingstone; 1994., 56.Sharkey NA, Marder RA. The rotator cuff opposes superior translation of the humeral head. Am J Sports Med. 1995;23(3):270-275.). When an injury (be it directly or through overuse) occurs to the rotator cuff muscles, they respond by swelling. The pressure within the muscles increases, which results in compression because the muscles in the shoulder are surrounded by bone. When this compression occurs there is a loss of blood flow in the small blood vessels. When blood flow decreases to the muscle repetitive motions fray the muscle. Radiographs of the fray muscle show a picture much like a frayed rope. Once this damage occurs routine motions such as reaching up behind the back and reaching up overhead may cause pain. Additionally, weakness of shoulder muscles may also occur. If the blood flow to the area continues to be constricted or stress injures the muscle, the muscle can actually tear in two. This is what is referred to as a rotator cuff tear. Symptoms of a rotator cuff tear include significant weakness of the shoulder, and often difficulty in elevating the arm. If the impingement is left untreated, bicep rupture may also occur. A major factor in shoulder impingement injuries in weightlifters is muscle imbalance. Many bodybuilders tend to train the pectorals and the lats significantly. These exercises tend to produce internal rotation of the shoulders. Exercises that strengthen the external shoulder rotators (the infraspinatus and the teres minor), and stretches to relieve the tightness to the internal rotators are often neglected. This results in overly tight shoulder internal rotators and weak shoulder external rotators, which can lead to impingement. Other contributory factors to impingement for bodybuilders is the amount of sets performed doing exercises that put a considerable amount of stress imposed on the rotator cuff muscles such as the bench press. Often you will see weightlifters doing upwards of 15 sets this bodybuilding staple (Incline, decline, flat, and smith machine). Too many sets of exercises for the same body part with excessive weight can result in fatigue and overload injury to the rotator cuff. Therefore, weightlifters should be encouraged to perform fewer sets of exercises that can result in fatigue and overload injury to the rotator cuff. Routine motions such as reaching up behind the back and reaching up overhead may cause pain. Additionally, weakness of shoulder muscles may also occur. Diagnosis begins with a medical history and physical examination by your doctor. Strength tests will initially be taken to determine if significant weakness is present. X-rays will often be taken to rule out arthritis, bone spurs, changes to bone contour or changes in the bone calcification that indicate injury of the muscle. Impingement may be suspected when an injection of a small amount of an anesthetic into the space under the shoulder bones relieves pain. An MRI or arthrogram may also be taken to identify impingement and rule out a rotator cuff tear. The vast majority of people who have impingement syndrome are successfully treated with anti-inflammatory medication, stretching exercises and temporary avoidance of repetitive overhead activity until the condition settles down. Only a minor percentage of people who have impingement syndrome eventually require surgery. Anti-inflammatory medicines are medications prescribed to reduce inflammation. There are two types of anti-inflammatory medications. They are steroidal or non-steroidal drugs. Nonsteroidal anti-inflammatory medications such as aspirin, naproxen (Aleve) or ibuprofen (Motrin, Nuprin), coupled with the use of ice to reduce inflammation and rest is the most common treatment plan for this condition. NSAIDs are particularly useful not only because they help decrease pain, but they also help control swelling and inflammation. NSAIDs are available both over-the-counter and as a prescription. All medications have side effects, and the most common side effect from NSAIDS is stomach or gastrointestinal upset. Therefore, NSAIDS should be taken with food, and discontinued if abdominal pain persists. Other common side effects may include nausea, vomiting, diarrhea, constipation, decreased appetite, dizziness, rashes, headache, and drowsiness. Another side effect of NSAIDS is interfering in the normal blood clotting mechanism. NSAIDs can cause ulcers in the stomach and promote bleeding. Patients on chronic NSAID use may notice easy bruisability, bleeding gums, or other signs of "thinned blood." NSAIDs may also cause fluid retention, leading to edema. The most serious side effects are kidney failure, and liver failure. If you have persistent symptoms, despite the use of oral anti-inflammatory medications, your doctor may consider a anti-inflammatory injection such as cortisone. Injectable cortisone is synthetically produced and has many different trade names (e.g. Celestone, Kenalog, etc. ), but is a close derivative of your body's own product. The difference being synthetic cortisone is a potent anti-inflammatory medication. Cortisone injections usually work within a few days, and the effects can last up to several weeks. [ Click To Join The Thread. ] Shoulder Bursitis. I have a bad case of shoulder bursitis...anyone ever had an inflammed/injured shoulder? Cortisone should be used only when necessary because it can result in weakening of muscles and tendons which then may subject to tearing. In addition to taking anti-inflammatory, ice should be used after any activity that may cause irritation. Daily controlled stretching in a warm shower may also help. Repetitive motion activities with your injured arm should be avoided. Motion where the elbow would move above shoulder level should also be avoided. Impingement rehabilitation begins almost immediately. Exercises to regain shoulder motion usually begin with a physical therapist in the first week after surgery and continue only for about 6 weeks. Impingement recovery is generally quicker and requires less supervision. Patient is typically assigned home exercise program at six weeks. Full recovery time after surgery varies; most patients have greatly improved at three months and are close to normal by six months. In cases where other shoulder and tendon issues occur recovery may be longer.